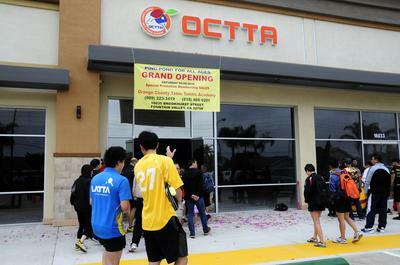 The Orange County Table Tennis Academy (OCTTA) is located in Fountain Valley, which is in the state of California, USA. The OCTTA is right off the 405. Visitors can reach the facility by getting off the 405 on Edinger and heading east 4 blocks. The plaza that the OCTTA is located in is across the street from the Miles Square Golf Course. We are located right next to NQ Jewelers. Visitors of any age are more than welcome to come and play. Day passes are $5 for any player of any age. OCTTA is open 7 days a week, 10 AM to 10 PM and the club has 20 tables for players to use. The OCTTA is built to give table tennis players the best facility to enjoy their favorite sport. All the tables are Butterfly tables and the floors are installed with professional rubber flooring. The flooring is the same used at the highest level. The lighting is perfect and there is ample space for players to play and rest. Currently the facility has 115 players at the club and hosts a 3-star USATT Sanctioned Tournament. 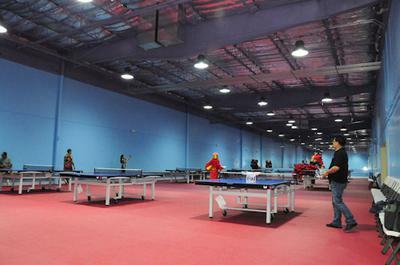 The Orange County Table Tennis Academy is Orange County's largest table tennis facility. The one factor that differentiates our facility from the rest is that our facility is solely for the use of Table Tennis. That means from 10 AM to 10 PM every day the space is meant solely for table tennis. What we pride ourselves about in the OCTTA isn't our professional equipment or coaches, but rather just the environment. We have a following of some of Orange County's most fervent fans of table tennis. When you play at our facility you will genuinely feel the passion in the air, from the kids to the more senior players. The Orange County Table Tennis Academy is founded by two partners, Dr. Tuan Le and Vu Doan. The project is spearheaded by Dr. Le who has had a lifelong passion of table tennis. For years his passion has been to open Southern California's best table tennis academy. Through all the year, Dr. 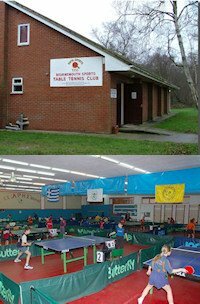 Le has seen multiple closures of setback and closures of past table tennis businesses. This has never deterred Dr. Le as the OCTTA has opened with the help of his brother in law, Vu. Smarter and more experienced in the business of table tennis and continually growing a following that has followed him from location to location, the OCTTA is poised to be the academy that unites and grows the table tennis community. Our ultimate goal is to be an academy that helps train the next generation of great U.S. table tennis players. 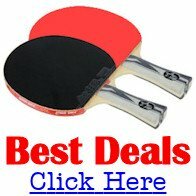 The Orange County Table Tennis Academy has many coaches to pick from. The head of our coaching program is Zaman Molla, who represented Iran for 5 years. He played in the World Championships, the Asia Cup and won 3rd place in the 2015 US Nationals. Zaman is also certified by the International Table Tennis Federation. If you have any specific questions or are interested in partnering up for a program please call (909) 223-3419 and ask for Dr. Tuan Le or Vu Doan, the founders of the club.